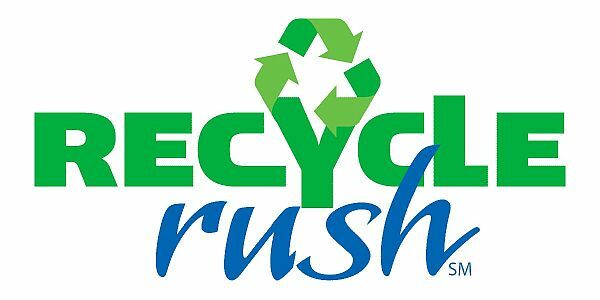 RECYCLE RUSH (SM) is played by two Alliances of three Teams each. Alliances compete simultaneously to score points by stacking Totes on Scoring Platforms, capping those stacks with Recycling Containers, and properly disposing of Litter, represented by pool noodles, in designated locations. In keeping with the recycling theme of the game, all scoring elements used are reusable or recyclable by teams in their home locations or by FIRST at the end of the season. During the remaining 2 minutes and 15 seconds of the Match, called the Teleop Period, Robots are controlled remotely by student drivers located behind the walls at the ends of the Field. Teams on an Alliance work together to place as many Totes on their Scoring Platforms as possible. 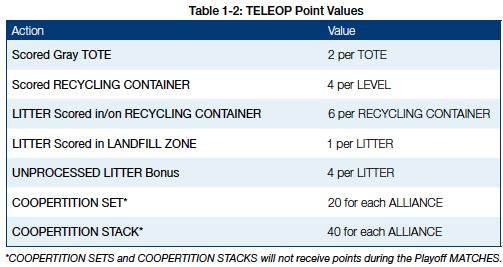 Alliances earn additional points for Recycling Containers placed on the scored Totes, with Recycling Containers at greater heights earning more points. Alliances also earn points for disposing of their Litter in either their Landfill Zone (the area next to the Step marked by the white line) or placing Litter in or on scored Recycling Containers. Alliances that unscored leave Litter on their side of the Field at the end of the match add points to the score of the other Alliance, as it is considered unprocessed and not properly disposed of. Points for the Match are awarded based on the state of the scored objects at the end of the Match (with the exception of Coopertition Points, which can be earned at any point during the Match). To rank well during qualification matches, and advance through the playoff matches to the finals, teams will want to work to maximize their score for each match. Except for the final matches, winners of individual matches will not be declared, as this has no direct bearing on tournament performance in RECYCLE RUSH. 51 Teams attended the 2015 SBPLI Long Island Regional. 607 Teams attended the 2015 Championship in St. Louis.